Levant, Victor. "Vietnam War". The Canadian Encyclopedia, 22 August 2017, Historica Canada. https://www.thecanadianencyclopedia.ca/en/article/vietnam-war. Accessed 19 April 2019. The Vietnam War was a Cold War-era conflict between communist Northern Vietnamese forces and United States-backed Southern Vietnamese forces. Canada officially played the role of neutral peacemaker, but secretly backed the American effort in Vietnam. 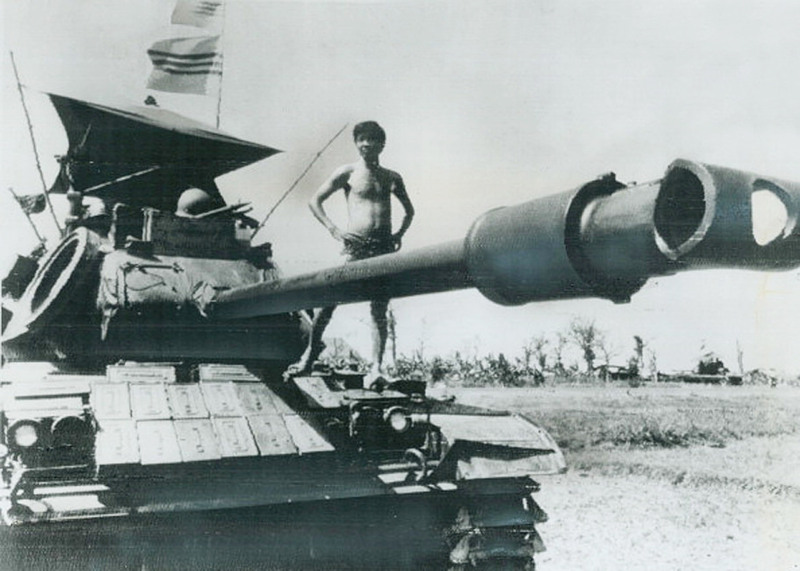 A South Vietnamese soldier stands on his tank to survey the situation at Xom Suoi, about 20 miles north of Saigon, on 7 February 1973. The Vietnam War had its roots in the French colonial conquest of Indochina in the mid-19th century and in the nationalist movements that arose to oppose it. At the end of the Second World War, on 2 September 1945, nationalist leader Ho Chi Minh proclaimed the Democratic Republic of Viet-Nam an independent country. He named the northern city of Hanoi its capital. The French attempt to re-conquer Vietnam met with defeat in the valley of Dien Bien Phu on 2 May 1954. The July Geneva Agreements provided for a cease-fire and a provisional military demarcation line at the 17th parallel, pending nationwide elections for reunification in July 1956. France withdrew. Western efforts to divide the country permanently by creating a Vietnamese republic in Saigon, coupled with the US refusal to hold the promised elections, led to rebellion, massive US military intervention and the ensuing civil war. While the US and its allies supported the South as a means of preventing the spread of communism in southeast Asia, China and its allies backed the communist North. The US tripled its military presence in the country in 1961 and 1962, but failed to defeat the North, which regarded the US as a colonial aggressor akin to France. The failure of US policy became apparent in February 1968 when 525,000 American soldiers were unable to stop the insurgents' Tet Offensive; it would take two more assaults, the third lasting six weeks, before US and South Vietnamese forces were able to stop the offensive and retake lost territory. In January 1973 the Paris Peace Accords were signed, upholding the unity and territorial integrity of Vietnam. It also provided for the orderly withdrawal of US troops, the release of 200,000 civilian detainees and Prisoners of War, and the organization of free and democratic elections in South Vietnam. The refusal to implement these last conditions provoked an armed insurrection and on 30 April 1975 the capital of the South, Saigon, fell to Northern forces. The city was renamed Ho Chi Minh City. The US withdrew from Vietnam. The cost of the war was staggering: 1.7 million dead, three million wounded and maimed, and 13 million refugees. The US dropped 7 million tons of bombs, 75 million litres of jungle-defoliating herbicide and lost 10,000 helicopters and warplanes. Some 56,000 US soldiers were killed and another 303,000 were wounded. The direct cost of the war was $140 billion; indirect costs are estimated at $900 billion. During the years 1954 to 1975 Canada served on two international truce commissions and provided medical supplies and technical assistance. Canadian diplomats were involved in negotiations between Washington and Hanoi and successive Canadian governments, both Liberal and Conservative, maintained that Ottawa was an impartial and objective peacekeeper, an innocent and helpful bystander negotiating for peace and administering aid to victims of the war. However, Cabinet papers, confidential stenographic minutes of the truce commissions as well as top-secret American government cables revealed Canada to be a willing ally of US counterinsurgency efforts. Canada's record on the truce commissions was a partisan one, rooted in the presumption of Hanoi's guilt and Saigon's innocence and designed to discredit North Vietnam while exonerating South Vietnam from its obligations to uphold the Geneva Agreements. Canadian delegates engaged in espionage for the US Central Intelligence Agency and aided the covert introduction of American arms and personnel into South Vietnam while they spotted for US bombers over North Vietnam. Canadian commissioners shielded the US chemical defoliant program from public inquiry, parlayed American threats of expanded war to Hanoi, and penned the reports legitimating both the rupture of the Geneva Agreements and the US air war over North Vietnam. Ottawa would later assert that these actions were necessary to counterbalance the activities of the Eastern bloc countries with whom they shared membership on the truce commissions. Canadian aid during the war went only to South Vietnam. 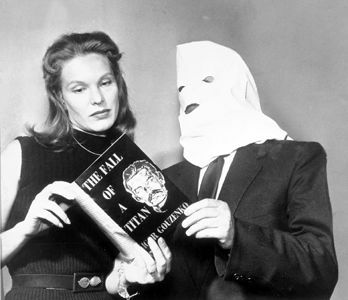 It totalled $29 million from 1950–75 and was routed through the Colombo Planand the Canadian Red Cross. Although humanitarian in appearance, Canadian assistance was an integral part of the Free World Assistance Program, co-ordinated by the US Department of State with the International Security Office of the Pentagon as the point of contact. In the field, Canadian capital assistance was regulated by the US-RVN Health Defense Agreement and administered by the International Military Assistance Force Office in Saigon. On a number of occasions, Ottawa stopped the shipment of medical relief to civilian victims of the war in North Vietnam. At home, 500 Canadian firms sold $2.5 billion of war materiel (ammunition, napalm, aircraft engines and explosives) to the Pentagon. Another $10 billion in food, beverages, berets and boots for the troops was exported to the US, as well as nickel, copper, lead, brass and oil for shell casings, wiring, plate armour and military transport. In Canada unemployment fell to record low levels of 3.9 per cent, the gross domestic product rose by 6 per cent yearly, and capital expenditure expanded exponentially in manufacturing and mining as US firms invested more than $3 billion in Canada to offset shrinking domestic capacity as a result of the war. The herbicide "Agent Orange" was tested for use in Vietnam at Canadian Forces Base Gagetown, New Brunswick. US bomber pilots also practised carpet-bombing runs over Suffield, Alberta, and North Battleford, Saskatchewan, before their tours of duty in southeast Asia. And the results of the only successful peace initiative to Hanoi — by Canadian diplomat Chester Ronning — would be kept from public knowledge in order not to harm official US-Canadian relations. Ten thousand young Canadian men fought in the US armed forces in the war. At the same time 20,000 American draft-dodgers and 12,000 army deserters found refuge in Canada from military service in Vietnam. The end of the war sparked a massive movement of refugees out of South Vietnam. Canada admitted more than 5,600 Vietnamese in 1975 and 1976 — mainly migrants with relatives already living in Canada. Beginning in 1979, Canada also welcomed about 60,000 refugees from among a second wave of migrants known as the "boat people" — who fled the country via dangerous sea voyages to Hong Kong and elsewhere. See also Americans; Sherwood Lett; James B. Seaborn.